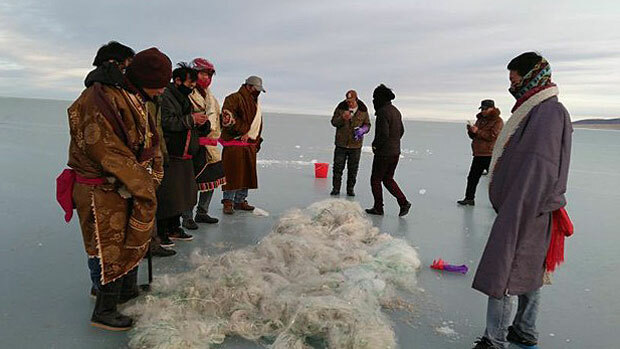 Chinese authorities are detaining and questioning Tibetans working to block illegal fishing at the province’s scenic Qinghai Lake, saying the Tibetans are intruding on their own responsibilities to enforce the law, local sources say. Chinese fishermen caught fishing in the lake are frequently released, though, after complaining that Tibetans have seized their nets and other fishing gear, one resident of the area told RFA’s Tibetan Service. “When the Tibetan activists take away the fishing nets and hand them over to the police, this results in disputes with the fishermen,” RFA’s source said, speaking on condition of anonymity. China’s central government has declared the area of Qinghai Lake, also called Kokonor, a tourist area and the lake’s fish a protected species, and have promised that anyone caught fishing in the lake will be punished according to the law, the source said. One activist had recently been held for four days, and was asked if he and his group had sent pictures or video clips to contacts outside the country, and whether they were being organized and directed by outside forces, the source said. “The authorities are angry with the local activists and accuse them of interfering with their own mandate to conserve and protect the environment of the lake, telling them they are turning the poaching issue into a big deal and are blowing it out of proportion,” he said. Also speaking to RFA, a second Tibetan source said that teams of volunteers from many communities around the lake have been working around the clock to stop fishing in the lake. “Tibetans are against fishing in the lake because of their religious beliefs. They consider it a sacred lake,” the source said, also speaking on condition he not be named. “There are many Tibetan monasteries around the lake area, and Tibetans traditionally do not eat fish,” he said. Incidents of illegal fishing have increased in recent years around Qinghai Lake, with local Tibetans stepping up monitoring activities in response, sources told RFA in earlier reports. Directives from China’s central government urging protection of Tibet’s vulnerable environment are often flouted at the local level by Han Chinese migrants to the area, experts say. Reported by Kunsang Tenzin for RFA’s Tibetan Service. Translated by Dorjee Damdul. Written in English by Richard Finney.